On March 6, 2012, the Oreo cookie celebrated its 100th birthday. Weber Shandwick was charged with ensuring that the celebrations were well publicized and received extensive media attention. The agency focused on bringing back the spirit of childhood while working toward a goal of making 1million birthday moments happen globally and asking consumers to submit their moments online. Oreo birthday present mailers were shipped to 30 top-tier food media and bloggers introducing targets to the new, limited edition Birthday Cake Oreo. 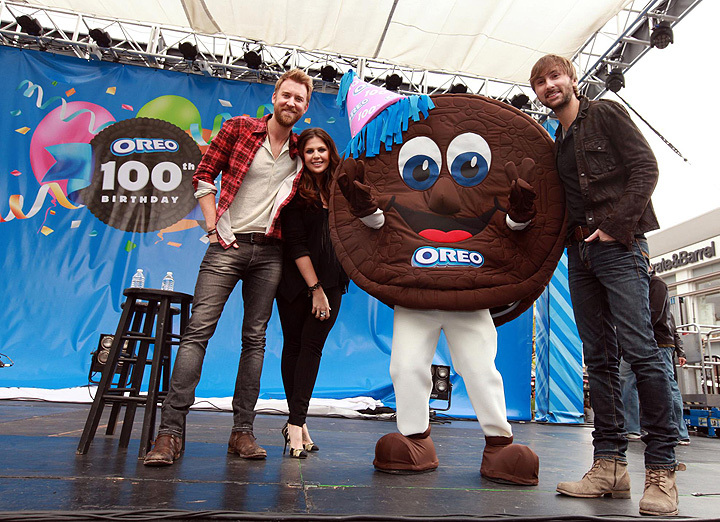 Country music group Lady Antebellum served as national spokespeople, delivering campaign messages via national media outreach, sending personalized video birthday shout-outs to entertainment media to drum-up pre-birthday excitement. At the Los Angeles party, they performed a surprise concert, and conducted media interviews with entertainment press. Post-event b-roll was distributed nationwide featuring the concert and event photos. A press release was distributed globally detailing the 100th birthday executions. The agency also distributed an Internet press kit nationally with photos, historic information, fact sheets, brand imagery and advertising material. Simultaneous “flash birthday parties” were launched in high-traffic business districts of seven cities: Los Angeles, New York, Chicago, Miami, Pittsburgh, Phoenix and Salt Lake City. The week before the birthday, local market media received party invitations to attend a surprise celebration. A pre-birthday b-roll package was distributed to top broadcast media seeding the birthday news and sharing historical assets, including advertising, photos and packaging information. The morning of the flash birthday parties in each market, the agency surprised broadcast affiliates with Oreo and milk birthday party drops, encouraging their on-site presence at the parties later that day and to further seed the new product. Events began with a 6’ x 6’ unbranded birthday present set up at the event location at midnight the night before, with a “gift tag” inviting unsuspecting consumers to release their inner child at noon the following day. At 12 p.m., the present launched party streamers 40 feet in the air, with a flash mob performance of an original “Happy Birthday, Oreo” dance and an appearance by Oreo Man immediately following. Party-goers enjoyed Oreo cookies and milk, games and giveaways. In addition, Kraft employees in six key offices were given a moment of childlike fun, receiving a toolkit of employee communication documents, signage and collateral. Each employee received a package of Oreos to take home and enjoy a moment with someone they love. The Oreo business unit received a flash birthday party dance experience, as well. The campaign delivered more than 600 million media impressions in the U.S., with coverage spanning local and national news, entertainment, food and lifestyle media, including an "Extra!" taping live from the LA party. The Birthday Cake Oreo received coverage in 26 of the 30 media outlets.